Members of the national champion 4-H Horticulture Judging team are (l.-r.) Wyatt Moravec of David City, Erik Henry of Omaha, Elizabeth Cunningham of Fullerton Emma Ketelsen of St. Edward and their coach, Extension educator Michael Rethwisch. 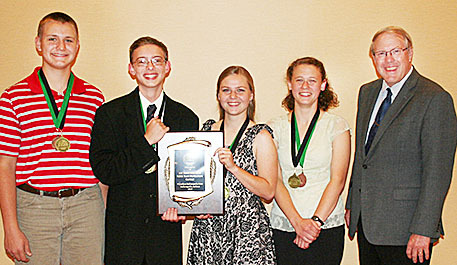 Nebraska’s 4-H horticulture judging team won a national championship earlier this month. The team, which included two Boone-Nance County 4-Hers as integral members, won the National 4-H Horticulture Contest held at Indianapolis, IN, during the first week of October. Emma Ketelsen, daughter of Brian and Renata Ketelsen of St. Edward, and Elizabeth Cunningham, daughter of Chis and Carla Cunningham of Fullerton, placed fifth and fourth individually, respectively. They were joined on the 2017 Nebraska team by Erik Henry of Omaha, who led the Nebraska team by placing third, and Wyatt Moravec of David City, who finished eighth. “This is truly a once in a life- time memory, as none of these 4-Hers can repeat this national 4-H contest,” said Steve Pritchard, Extension educator in Boone and Nance Counties. The Nebraska team members were selected from their placings at the State 4-H Contest in Grand Island during the first weekend of the Nebraska State Fair. At the national contest, contestants identified 100 horticultural specimens, eight sets of judging classes, and took an 80-question written test. Read more in the Oct. 25 Albion News, print and e-editions.